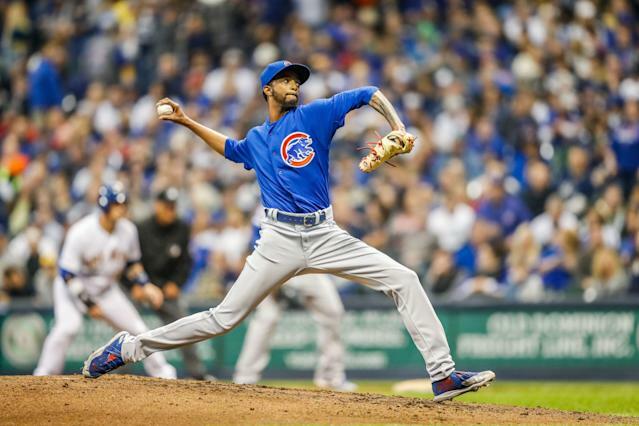 Major League Baseball is investigating a racist Instagram message that was sent to Chicago Cubs reliever Carl Edwards Jr. around the time he was demoted to Triple-A, according to Patrick Mooney of The Athletic and confirmed by ESPN. Edwards, 27, has struggled mightily on the mound this season, racking up a 32.40 ERA in just 1 2/3 innings. The Cubs demoted him on April 6 so he could have some time to clear his head and hit the reset button. The Cubs and team president Theo Epstein released a statement about the incident, via the Chicago Tribune. “We were shocked by the racist, profanity-laced social media message sent to Carl Edwards Jr. earlier this month. We vehemently condemn the content of the message and are supporting Major League Baseball’s investigation to identify the person responsible. Edwards has not spoken about the message or released a statement, but his agent, Lee Long, spoke to ESPN. "While he has mentioned being upset at social media attacks in the past, the recent incidents are completely beyond normal fan frustration. No player should be expected to bear such personal attacks especially based on the color of their skin. CJ has made a point to mention how appreciative he is of the Cubs fans for their support. Furthermore, we are very appreciative of the efforts of the Cubs, MLB and the union in addressing this matter." There are just 68 African-American players in baseball today, amounting to 7.7 percent of all players.